Amal Clooney has opened the doors of her mansion to Ms Leibovitz, for an ‘at home’ interview, set to be published in a few months’ time. Amal Clooney has also borrowed £7 million of diamonds to wear for the occasion. The jewels, said to have been lent by Cartier, were delivered to the mansion on the banks of the Thames in a bulletproof Brinks security van last Wednesday. Annie Leibovitz already photographed Amal in the past for Vogue Magazine. Unfortunately most women in Lebanon, with a 40% poverty level, will not afford Vogue.. damn..
You must not know Lebanese women very well honey poverty never gets in their way of fashion or fashion magazines ! Being realistic has never been one of her assets. I’m looking forward to seeing and reading! Vogue chooses the outfits and accessories. The person interviewed has the right to refuse items, but there are usually a number of outfits to choose from. Amal has kept a low profile since the birth and I suppose this also has to do with the Met ball that she is co-chairing and is Wintour’s baby. Wintour has acted somewhat as a mentor to Clooney, so I suppose this is payback in a way. Whatever, I am interested! The good news – I will be at a family wedding where the Miknas ( Amal’s Mom side) will be there and Amal will be officiating the wedding ! Soos- Lucky you are 😌 when & where the wedding will take place? That’s just an act. If Amal didn’t love all the attention she gets in that regard, she would not be chairing the met ball which is all about fashion. An another example, soon after Cindy Crawford and a bunch of super models showed up in Versace gold dresses during fashion week, Amal showed up in vintage version of that same gold dress at an event. Even though she looked terrible in it and her look screamed fashion victim, it was obvious that she was doing one of her “try too hard” fashion moments. She may play “miss humble” inher interviews, but thats just an act. If you love fashion and attention, stop trying to pretend otherwise I’m your interviews. As much as I’m not a fan of Kim Kardashian and Rhinna, at least they don’t try to pretend they don’t like it. Angela- This is written as though Amal is reading the blog which I doubt. I can’t imagine why she would. I don’t think any of us know what her motives are for what she does regarding fashion. Jackson: logical and rational thinking is much appreciated. What is not appreciated is using that as a sword in your arguments but then using your personal agenda (whatever that might be) to attack others as being “wrong.” How do you know so decisively what is true and what is not true? According to you as gospel: Amal does NOT read this blog, you say that with such assurance, how do you know, where is your evidentiary proof? But, if someone makes an assertion you cut through it and insult the poster. Shame on you. I do not think Amal would be proud of such behavior. I believe it was Sasha (?) who made a very insightful observation: Amal is a woman who loves the glamour, attention and cameras who probably dreamed of being famous when she was a young girl. But, at the same time, she is serious about her work and is smart and clever. I sign onto that assessment. I believe Amal is both. She loves the fame and she loves her work. She loves the cameras following her like she’s on a catwalk and posing, but also loves the legal intricacies and tackles cases that she believes worthy of press and hence the spotlight she can bring. Soos, sorry but your comment has nothing to do with logical thinking. If Amal was not addicted to fashion, she would not have been acting, posing like she did and still does. I feel no respect for someone that loves interviewing worldwide dictators. She said that in another interview, before her daughter ended up with the Clooneys,, and especially she admired Fidel Castro, Cuba’s communists’ dictatorship for 50 years. How can you approve a dictatorship with so many years of repression, misery, thousands of political prisoners some dead in jail, and all is documented extensively by Amnesty International? How can you place her loved for Socialist/Communist dictatorships with her daughter’s “human right work”? and her ultimate love for fashion consumerism, millionaire living style.. ? Interviewing someone is a journalist job – u can’t jab at a journalist for doing an interview that is dangerous mindset to our society. I won’t disagree that the Alamuddins don’t have opinions and thoughts ( she does stab at Israel in this interview ) but their country was torn apart by war with Israel so she should have an opinion right ? Coco2- I do not share your views because I believe that journalists should be free to interview whoever they please including dictators. They actually do a great service to those of us who want to understand what is going on behind “repressed doors.” But we have to depend on the integrity of the journalist and there are many (Fox news in my opinion) who I do not trust. I have not listened to Baria’s interviews so I cannot comment on whether there was bias in them. A real journalist searches for the truth, so when interviewing a communist dictator, that has a long list of documented cases in Ammesty international, the journalist would try to search the truth also behind the lies of of the dictator, ie interviewing regular citizens, instead of believing and adoring the dictator BS. Otherwise it shows that the journalist is not only not objective, but it has a defined political agenda. Let’s not insult the journalism profession. Some truthful journalist have died in pursue of the truth. Instead she is comfortable and always pretty looking interviewing dictators and questionable leaders that she agrees with. What Baria does is not journalism, is politics and marketing. She created a marketing company anyways. Many highly respected journalists have interviewed dictators for decades. Barbara Walters famously interviewed Castro and gushed about how charming he was. I just watched an interview done by 60 minutes with the Prince of Saudi Arabia, last Sunday. I don’t remember the interviewer’s name but I’ve seen her before. She appeared apprehensive, at least . He not only didn’t answer pertinent questions but deferred most to support his agenda. She did try but he wouldn’t even dignify her questions. Don’t forget that after the interview, you want to get home to your family, alive. You don’t seem to understand what’s at stake and how one would have to submit, to some degree. And, who said she ‘approved’ anyone? She was doing her job. This is a bunch of hooey. Amal has never taught at Harvard and according to an interview with George he reported that he proposed in April. Agreed. Since when does Baria beg Amal to avoid cameras. In fact, Baria was even quoted after the Clooney wedding as saying that now they are famous. Baria is also often with Amal in her celebrity photos. She loves the camera as much as her daughter does. Regular presentations at legal conferences and seminars. There is no fooey here – it’s disrespectful of u to say that about her own mother – based on her words in an Interview . Oh sure, how did they call Georgieboys former “girlfriends”? Tacky was the word, right. Can we stop this charade about the saint Amal, please? What about Eric and Amal? And this fiction about George Clooney, the womanizer! Please! Do I really have to say it? Did you ever hear any of his socalled former “girlfriends” say, that he was the love of their lives? That they are heartbroken because of the split? They all moved on very quickly and they never looked back! Now, why would that be? The grandfather on the father side and the aunt on the father side were both addicted to either alcohol or tablets. And I have seen enough photos of George Clooney which showed him totally drunk. So I count 1 and 1 and that makes two! This is an illness and since more than 1 person is affected in one family it is genetic. I find it very problematic, that he fathered two children. Furthermore I do not believe that he is very interested in woman at all. So which woman in her right mind would marry him? Geeze, you need to chill out. We’re not talking about your brother and his choice of wife nor your sister and her choice of husband. That was a bit much, to say the least, don’t you think? Honestly Sasha where was your outcry when the other woman were bad mouthed? I do not remember seeing any comment by anybody here. I don’t like when people think that I’m a fool and I do not believe in this oriental fairytale spun by Amals mother. Madame Alamuddins PR is old fashioned and she should let professionals do it. Furthermore, Alcoholism is a DISEASE. It is not the fault or the weakness of the addicted. I would never condemn these people, NEVER! But your reaction is the reason why the addicted don’t get help and prefer to hide. Soos- Amal did not teach at Harvard and she was engaged by the time of George’s birthday. What you now report is different form your interpretation of Baria’s interview. Frankly, I just do not believe you. Let’s leave it at that. Soos- I suggest you go back to your assertion on March 14 where you state she taught at Harvard. You are so obsessed with Amal that your report gossip as though it was truth and then as new gossip comes in you change your story. I said then and I say it again, what you wrote is a bunch of hooey. You cobble together gossip and treat it as truth. Amal has not taught at Harvard in any capacity and the rest of your gossip is just that. Maybe you want to correct your previous post where you clearly stated, “lol Amal was teaching a class at Harvard…” There is no read comprehension problem on Jackson’s part, but there is one on yours where you start denying your own post. Amal’s CV does not have her ever teaching at Harvard and HLS does not have her ever teaching at Harvard. It is easy to check. Oh and seminars just so you do not make another faux pas are normally not private invites at HLS. You need to chill and stop being offended at every turn. The use of a word like “retarded” is unacceptable in social media and society in general. Rain- Why on earth would anyone read anything about them on social media that is 95% critical. They would have to be nuts. So, yes, I believe that Amal does not read this blog. I am amazed that you believe that Amal does read this blog. 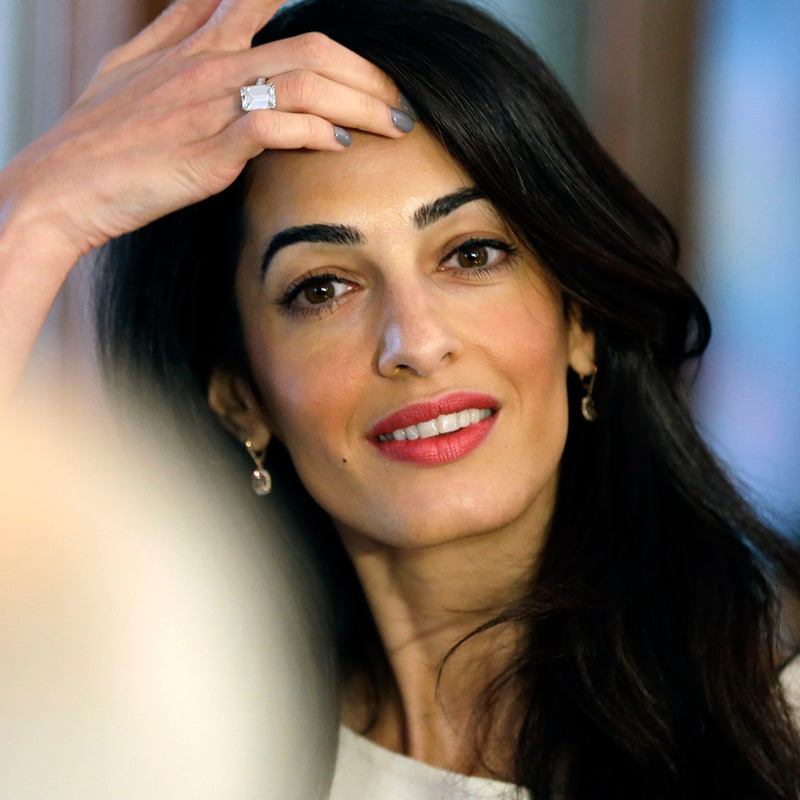 According to the televised interview made by sheikh Ramzi Alamuddin AMAL Clooney’s father – not a typed interview A TELEVISED INTERVIEW IN HIS OWN WORDS Amal and her sister read this blog ( not continually ) so before Jackson CALLS THIS A LIE AS SHE HAS WITH BARIAS TELEVISED INTERVIEW I POSTED WHERE SHE EXPLAINS ABOUT THEIR “ fast paced relationship “ here is that interview. Jackson stick to what u know and like .. just state ur opinion on what she wears – everything else is garbage coming out of ur mouth – evidenced by MANY PEOPLE stating this over and over again on this blog —- and if u want to dispute that too —— kindly scroll through ever single post here and the comments . Jackson, I do not know anything to the degree that you know about Amal as you do. ++shaking head++ It is borderline scary. Jackson where is your proof that Amal does not read this blog? Where is the evidence that you require others to have when they make any assertion that is contrary to Amal. So I ask again, where is your proof, evidence m, wishful thinking? Rain- Go carefully through every post here and tell me why Amal would read the blog. And while you are reading take a careful look at my wording. I said I could not imagine why anyone would read the blog. I then said I could not believe anyone would read it. My use of language was purely speculative, not an assertion. Words means something. @ Sasha Ultra-critical @Jackson never ceases to disappoint! I’m amazed that you would be so sure of anything a celebrity would or would not read. That’s a very arrogant view. I wouldn’t even venture to guess. By the way, which ‘Jackson’ are you? The one who finds no fault with Amal or the ultra-critical one? Never mind, reading upward I can see that you are the ultra-critical ‘Jackson’. I do agree that she doesn’t read this blog, but she doesn’t have to. I don’t understand why some of you take such pleasure in berating others for their opinion. This isn’t a contest, it’s a blog devoted to Amal. Say your peace and move on. As it turns out, when I do come here to see what’s happening with Amal, George and the babies, all I’m doing is asking people why the hell they are being so rude. How often did i write it here: why does anyone react on jackson”s nasty comments? Ignore him please!